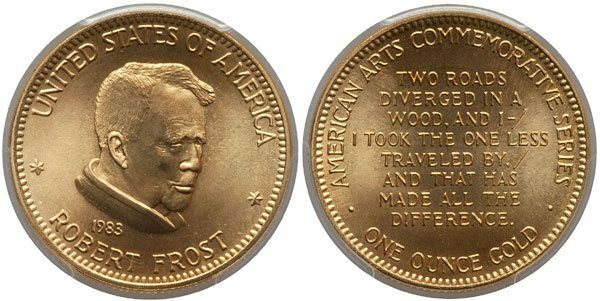 The American Arts Gold Medallions were issued from 1980 to 1984 as a series of Congressionally mandated gold bullion pieces. For each year of the series, separate one ounce and one-half ounce pieces were produced featuring famous American artists. While the series experienced slow sales and was deemed by some as a failure, it did set the stage for the immensely popular and successful American Eagle gold and silver bullion coin series. The origin of the American Arts Commemorative Series can be traced back to Executive Order 11825 of December 31, 1974, which revoked the measures of previous Executive Orders and once again made it legal for private citizens to own gold coins and bullion. Starting in 1975, the Treasury Department began selling off gold from its bullion stockpile, however since the sales were conducted in 400 ounce ingots, they remained beyond the reach of the average American. Instead, individuals turned to gold bullion offerings from other countries, such as the South African Gold Kruggerands, which were being imported at a rate of more than one million ounces per year. In 1978, Senator Jess Helms of North Carolina introduced a bill which sought the production of one ounce and one-half ounce gold medallions to provide the general public with an affordable American bullion option. The proposed medallions would feature the head of the statue Freedom from the Capitol Building and the great Seal of the United States. A separate bill introduced by Representative Jim Leech of Iowa called for the issuance of medallions honoring American artists. Ultimately, Leech’s American Arts Gold Medallion Act would be attached to the Financial Institutions Regulatory and Interest Rate Control Act of 1978 and signed into law on November 10, 1978. 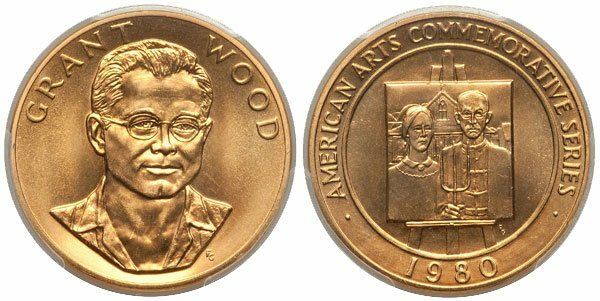 Public Law 95-630 required the issuance of one ounce and one-half ounce gold medallions struck in 90% purity and commemorating outstanding individuals in the American arts. The bill specifically named the individuals to be honored for the five calendar years of the series: Grant Wood, Marian Anderson, Mark Twain, Willa Cather, Louis Armstrong, Frank Lloyd Wright, Robert Frost, Alexander Calder, Helen Hayes, and John Steinbeck. The reverse of each medallion was to contain a design representative of the artistic achievements of the individual being honored. The only required inscription was “American Arts Commemorative Series”. The law indicated that the medallions should be sold to the general public at a competitive price equal to the market value of the gold plus the costs of manufacturing and marketing. Production of the medallions would begin in 1980 and take place at the West Point Bullion Depository with 1,000,000 one ounce pieces and 500,000 one-half ounce pieces struck. Sales were dismal compared to the number minted due to a number of factors, including a cumbersome ordering process as well as problems with the medallions themselves. The most commonly cited issues were the lack of any indication of the issuing authority, gold content, and legal tender status. Over the ensuing years, various changes were made to the program in attempt to bolster sales. This included turning over distribution of the medallions to a private firm J. Aron & Company, as well as changes mandated by the Treasury Department to make the medallions seem more coin-like. The inscription “United States of America” was added to the obverse and “One Ounce Gold” or “One Half Ounce Gold” was added to the reverse. Additionally the medals were given denticles around the circumference and a reeded edge. Changes were also made to the composition and packaging of the medallions. Ultimately, the changes had little impact and by the time the series concluded, mintages and sales levels were at an all time low. At this point, the method of distribution had changed once again to a telephone marketing operation carried out by the United States Mint. In the year following the conclusion of the series, the Mint offered complete sets of the one ounce or one-half ounce medallions. After this final sales period concluded, the remaining medallions in inventory were melted. Despite the lack of success of the American Arts Gold Medallions program, it did set the stage for the production of legal tender gold coins, which were widely popular and enjoyed robust sales. In 1984, the United States Mint issued legal tender $10 gold coins to commemorate the Olympics, which would be followed by many more commemorative gold coins. In 1986, the American Eagle bullion coin program launched with legal tender gold and silver bullion coins. These bullion coins went on to become the most popular in the world, selling millions of pieces annually.